Right To Ride was established in 2009 and its purpose and objectives were modelled on traditional riders rights groups that can be found here in the UK, in Europe and the USA. The main objective of Right To Ride until 2015 was to carry on activities, in particular (without limitation) to promote awareness and understanding of training, environmental road safety and security issues relating to the use of those vehicles classed in law as motorcycles, scooters, mopeds, motorcycle combinations and tricycles and to research and investigate solutions to these topics. In other words we promoted and protected that collective lump of metal, rubber and plastic that we could not live without – the motorcycle – and all that it means as part of our way of life. 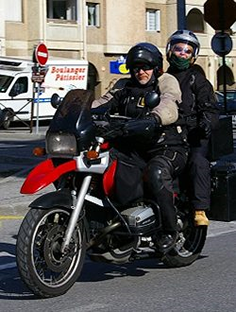 Right To Ride was formed around its two protagonists Trevor Baird and Elaine Hardy, who both have been involved in Riders Rights for several years if not a couple of decades in various forms. 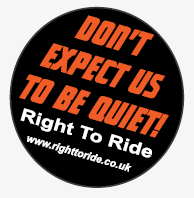 Right To Ride was not formed around a committee with working groups and sub-committees thus we could have reacted very quickly to any issues and more importantly comment in a clear and unobstructed manner. Don’t Expect Us To Be Quiet! As our slogan said “Don’t Expect Us To Quiet!” about riders issues but to expect us to have listened to riders concerns and present these concerns by consultation with and support from riders. This helped us to define our position on the issues and to explain to the uninitiated about why motorcycling is such an important part of the lives of millions of people not just here in Northern Ireland but across the globe. Whenever our position was there was always a line that did not cross when engaging with authorities and decision makers, principles which we did not compromise under any circumstance. It would have been a sad day if we had not been able to express our views openly and even forcefully if necessary. 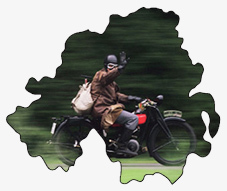 Issues that are the basis of a passionate debate – Caring about the rights and welfare of motorcyclists! In 2010 we separated out, although these issue can overlap, the European riders issues from the Northern Ireland riders issues. The website concentrated on legislation from the EU Commission and how this is dealt with by the legislative process especially at the European Parliament. Right To Ride EU had the objective to keep it simple and provide information about legislation from the EU Commission, EU Parliament as well as other motorcycling issues and those from other European countries. 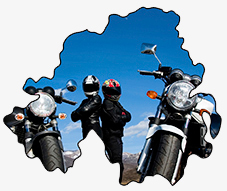 We offered the chance for individual riders and motorcycle clubs to support Right To Ride with our supporters scheme. There was no membership fees just a commitment as an individual rider or club for their support. Supporters received a supporters card and our Press Releases – On – Line Newsletter – Associated Articles. With that commitment, not only is knowledge power but numbers from the motorcycle community gave Right To Ride representative power. We could have not done this without that support and commitment. We also ran a Business supporters scheme which originally had no membership fee. However we would have liked to do more, to expand our horizons we needed financial support. We understood that times were hard and we did not expect individuals or clubs to finance us, although donations were welcome. We hope we fulfilled our objectives and using our voice as a fresh and alternative approach with the backing of individual riders, clubs, trainers and anybody else who cared enough. We had no deals on insurance, travel or cheap clothing. But if the opportunity arises, we pointed riders in the right direction – For Free. No membership fees, nothing but the support of riders, to put the case for riders in the corridors of power. Please feel free to roam around the website to find all the issues we were involved in and reported on throughout the website from news to rider events to consultations to links, a virtual library and campaigns. In August 2015 we made a life changing decision, which was to “retire” from riders’ rights, close down Right To Ride and head to a warmer climate. However we could not stay away from motorcycling issues and in 2016 we re-launched a previous blog at Motorcycle Minds.Articles in Motorcycle Minds focus on topics with a “riders rights” slant as we aim to give fellow riders and non-riders the knowledge with which to make an informed opinion with the opportunity to comment on the issues if required, as we promote motorcycling in its various forms, the individuals and groups that ride motorcycles in all their forms. This website is the online presence of Right To Ride and Write To Ride. Trevor Baird – Elaine Hardy – Partnership.